Big Brother Gossip: It's Official! 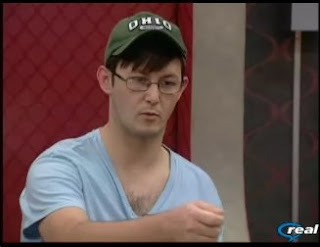 Veto ceremony was just held, and Casey was indeed put up! A newly energized Ronnie is now holding court with his best pals Jessie, Natalie, Chima, and Kevin(?). Apparently, some strong words were said by Jessie. Can't wait to see it tomorrow! If I was Casey, I would be an absolute prick to Ronnie and Jesse the rest of the time. Irritate them and make them uncomfortable. Maybe even get steroid head to react and do something stupid. Why sit back and count the days? I wonder what it is that Jesse said? UGH! They are letting rat boy talk strategy because now Jesse is powerless. He has to rely on the next HOH and it could be rat boy. I would rather listen to the BB theme and watch the fish tank on the live feed than listen to rat boy. Who is the other nominee? Do they indeed have the votes to get rid of Casey? Yeah I'm pretty sure they got the votes. My old lady is convinced that CBS is dumping Big Brother. Julie is knocked up and she and Les are going to have a little kid around the shack. She won't be doing BB anymore. I have to admit, if they wanted to kill off the show, bringing Jessie back in would be a stroke of genius. This is two really weak casts in a row. Kinda makes you paranoid. I see where you're coming at Jello. I didn't hate season 10's cast. However, I don't care for Alison what's her name. I did read somewhere, that the feeds are up 235% this year compared to last year. I don't know how that makes a lot of sense though. I wish I had Julies job. What does she work, 90 minutes a week? Tough schedule. I turn the feeds off as soon as Ronnie appears. Casey even said last night, "my only ally's girlfriend is also up". He knows he's fucked. Yeah he knows. If I was him i'd take off the banana. Tell everyone to screw themselves. If ONLY Brian or Jessica got back in. Oh man I wanted Jessica back SO BAD. Although it could have been hard to tell her and Jordan apart, but that's a challenge I was willing to take. And Jesse is going to win this whole damn thing. Guarantee it. He's somehow managed to wedge himself into a pretty solid spot. Unless they drop the Clique angle soon he's going to make a deep, deep run. It will be fun to watch everyone turn on eachother once Jordan is gone. I hope Chima goes soon...she does and says nothing to add to the show, for me. Oh By the way DAVID, Ronnie, Jesse and Natalie ruins it for you and the pack , to tell you the truth, Im enjoying the hell out of it. Kevin could make it far in this game as a floater. Nobody considers him as any kind of threat and Jesse thinks he is on his side. LMFA0 at the vote of people being done with BB after casey, jeff and jordan is eliminated. Well one is down and 2 more to go people. Well, who do you like "AName"
David said: I did read somewhere, that the feeds are up 235% this year compared to last year. I don't know how that makes a lot of sense though. I can't believe Casey isn't trying to sway Jeff to dump Jordan so he can get his head in the game... I mean if he is only in there for the showmance then he should go. I didn't like Casey much at first - but then I did like Lydia and now can't stomach her... I have been all twisted around this season with my first impressions. Come on Casey get a plot going and convince Lydia and Kevin you will go after Natalie if they keep you... in reality getting her out is almost like taking Jesse out since she is half his brain! Half his brain? That's a bit of an over statement. She's one brain cell short of being his ENTIRE brain, which in itself is a sad statistic. If the next competition is an endurance comp, which it may be since there was one around this time last year (right before Jesse's sweet eviction...WINK WINK), the balance could change dramatically. I am sure Jeff and Jordan won't go next - something is going to happen. And people won' tcancel their feeds - they will still find a reason to watch. At this point Casey looks like a beaten dog. I don't even think he is going to make much noise at all. I agree with IndyMike. Something is going to happen this upcoming week. I'm hoping Jeff gets HoH. Ronnie has no idea what he's talking about right now. 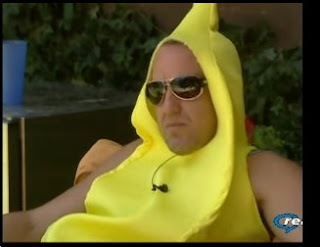 Casey is so entertaining though, even as an angry banana. I'm really going to miss watching him. I stated in an earlier post AName that I think Russel could be swayed- he knows that he comes second to Natalie with Jesse and that is not a place that Russel likes to hold. I think he would vote to his advantage and let Jesse think someone else was screwing him over... in fact... Russel could prob convince Jesse that Rat boy was the swing vote and who wouldn't believe that? Casey is gone. Russell will make a move if the athletes or rat boy don't win HOH. Otherwise it wouldn't be worth it. I agree Ritchie, Russell needs to make his move next week. I just hope they take the team thing away so people can put up who you want to put up. Casey has got to go. His smoking is nuts. he makes more noise exhaling. It's as if he is trying to blow out 100 candles each time.Between him and the sounds of eating ( others too ) I am constantly muting the sound.